Greetings ASWT blog followers! We realize we have done a poor job of keeping up with our blog for the past few months, but we wanted to share a few highlights from the 2015 season at Eagle Cave. As we said at the beginning of the spring session, our focus was on the south wall of the Eagle Cave trench (see ENC Act 2). The look of the trench changed dramatically as the season progressed – as did the crew. Photo at top from February, photo at bottom from late May. As is often the case in archaeology, our initial goals for finishing our work on the south wall were a little too ambitious, and we had to modify our plan. While we had hoped to step and profile the entire trench face, what we did instead was focus on the upper “zone” within Eagle Cave, and intensively sample those strats (leaving the lower deposits for the 2016 season). 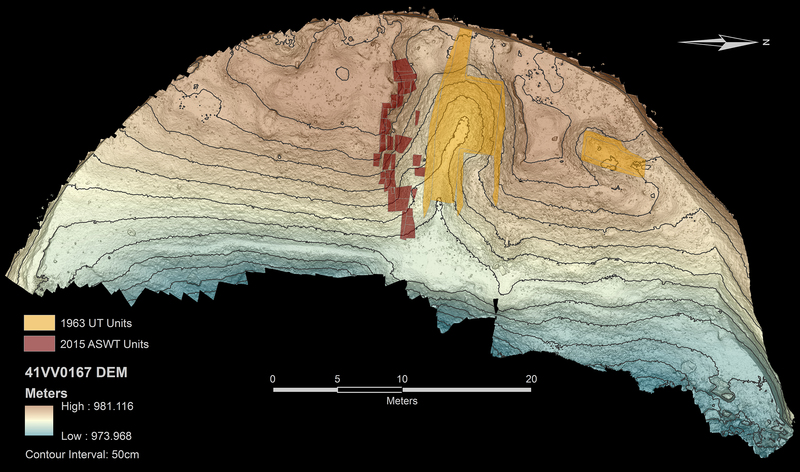 These are all 2D orthographic images of the trench generated from SfM during the 2015 season. The scale and alignment is constant. 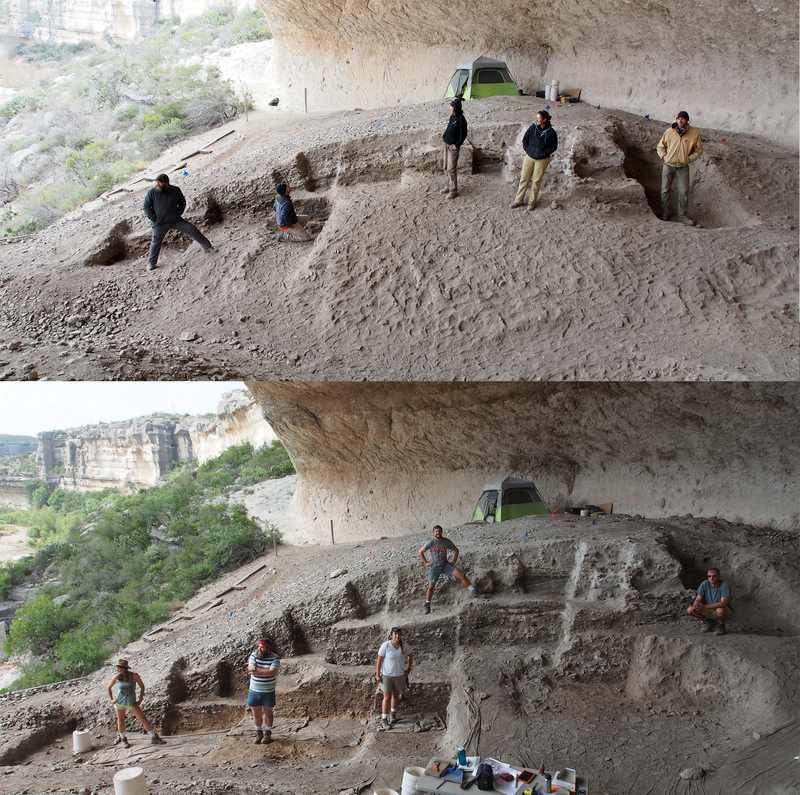 Rather than creating a tall, vertical profile across the entire shelter we “stepped” the profile as we excavated. This gives the profile itself a very unique shape, but follows our motto of “Low Impact, High Resolution.” The stepped profiles and excavation units are more stable, and we only excavated small areas to do as little damage to the site as possible. What was also striking was how far back the edge of the trench had eroded since the UT excavations in 1963. Where we encountered intact deposits at the top of the trench was nearly 5 meters (~16 feet) south of the original 1963 trench edge. All of our units were relatively small in size, and were placed to expose the intact deposits on the south side of the trench, but also do as little harm to the site as possible. As we were excavating we realized we had strikingly differential preservation of materials between the dripline (front) and the rear wall of the shelter. 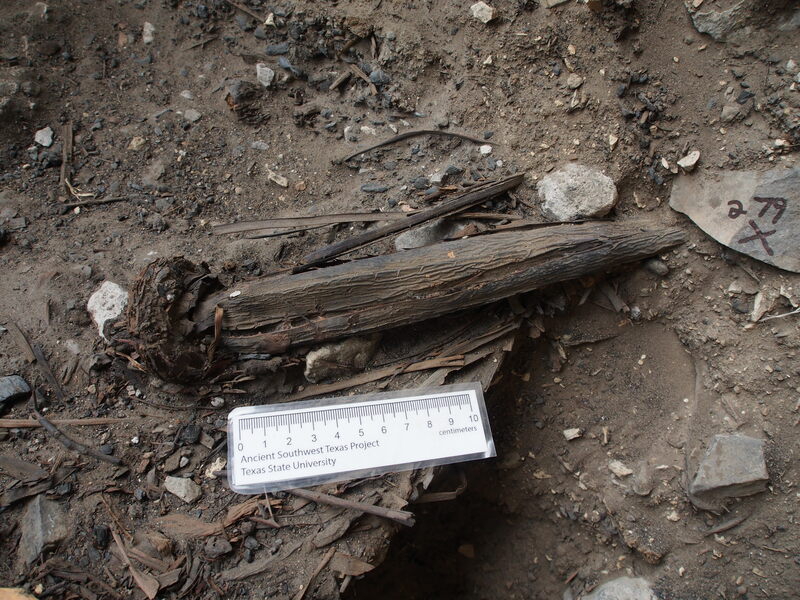 We had expected to find more fiber and plant remains preserved towards the rear wall, but in fact we found the best preservation to be towards the dripline. In this area we had thousands of fragments of lechuguilla, sotol, and yucca leaves along with innumerable seeds, pieces of wood and sticks, and other plant debris, whereas we encountered mainly ashy and reworked deposits toward the rear. A nearly complete desiccated lechuguilla plant from the fiber zone in Eagle Cave. The primary component of these fiber zones are thousands of preserved plant parts like this. 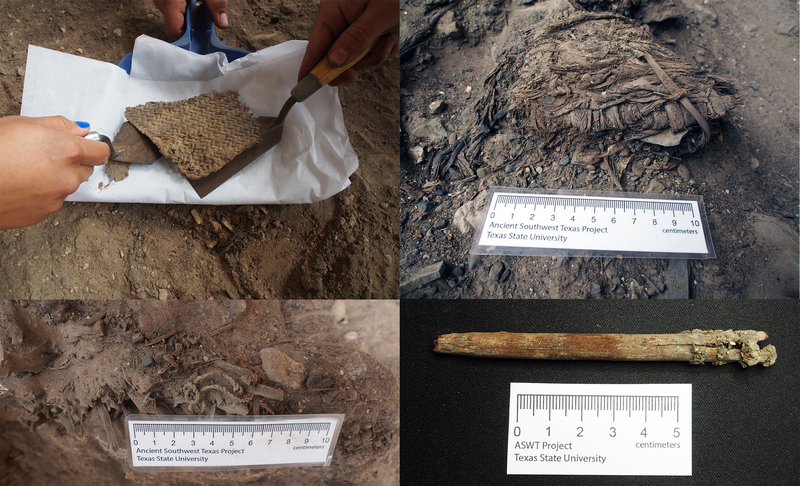 In the fiber zones we also found some really extraordinary artifacts that archaeologists normally do not get to find: fragments of cordage, knotted fibers, sandals, a basketry fragment, and an atlatl dart foreshaft! Perishable artifacts recovered from Eagle Cave (clockwise from top right): sandal fragment, foreshaft, cordage, and matting fragment. 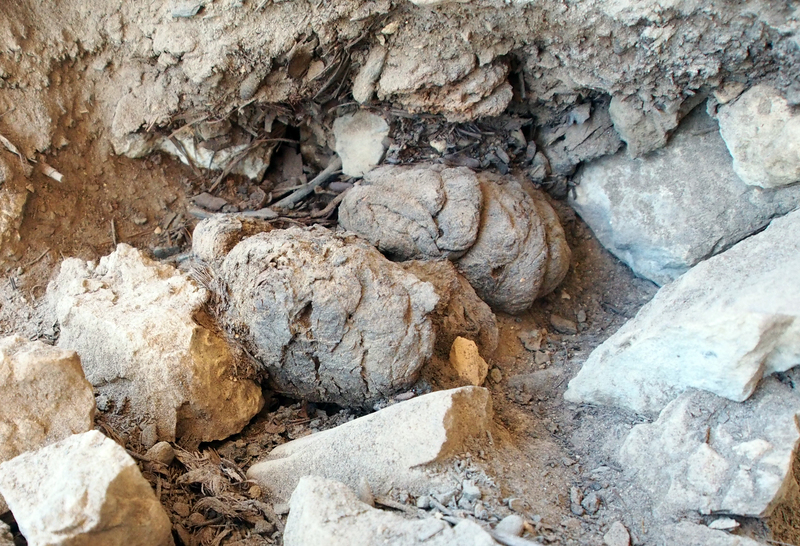 As fascinating as all the perishable artifacts are, we found something even more important: coprolites! Emily wrote an excellent blog post on coprolites (see From the Bowels of the Lower Pecos) so I won’t go in to much detail, but we recovered hundreds of fragments of coprolites. These artifacts will become invaluable as we begin to study how the people used Eagle Cave because they provide a direct link to what the people ate. A pilot study of Eagle Cave coprolites is being undertaken by Texas A&M Ph.D. student Chase Beck. Over the course of the spring we recovered hundreds of coprolites (in various sizes, shapes, and colors) from the fiber zone in Eagle Cave. Speaking of what people ate, we also found a variety of well-preserved faunal (animal) remains. Although most of the bones were from small animals (like rabbits, mice, squirrels, and fish), we did find evidence of larger game like deer, bison, and antelope. This probable antelope skull fragment was recovered during excavations. 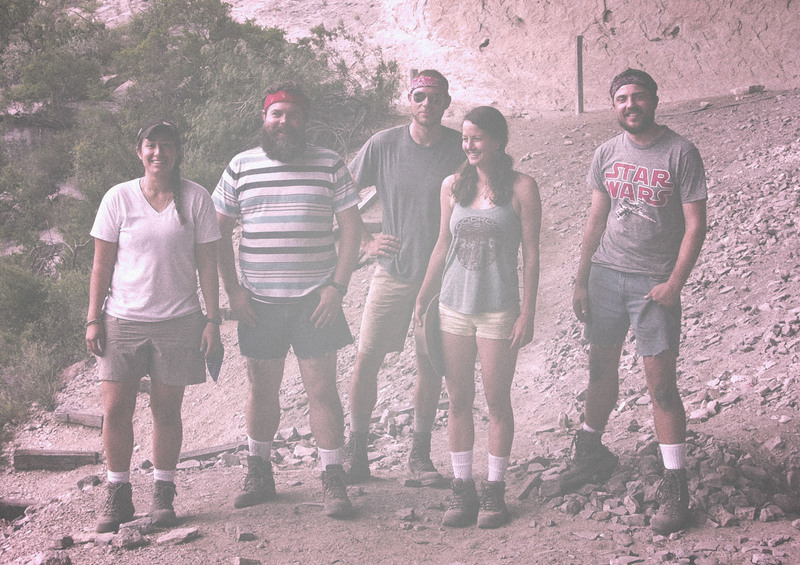 Throughout the spring the core crew (Koenig, Heisinger, Larsen, Pagano, and McCuistion) did an outstanding job of managing the thousands of samples, artifacts, 3D models, photographs, and countless other pieces of archaeological data. We were fortunate to be able to share some of what we had learned in Eagle with our colleagues when we hosted an Eagle Nest Canyon Research Palaver, May 8-9th. We had nearly 40 people come tour the site and discuss our methods and findings. 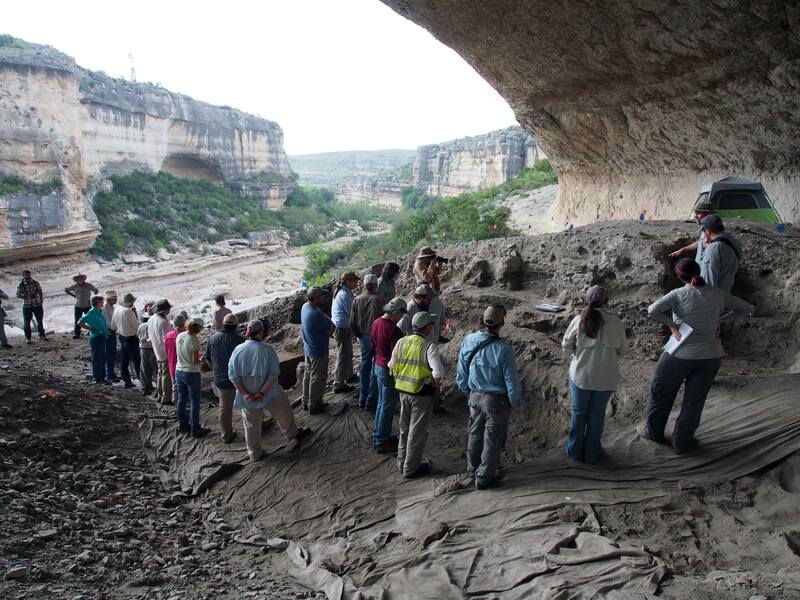 The Core Crew discusses our work in Eagle Cave with the palaver participants. 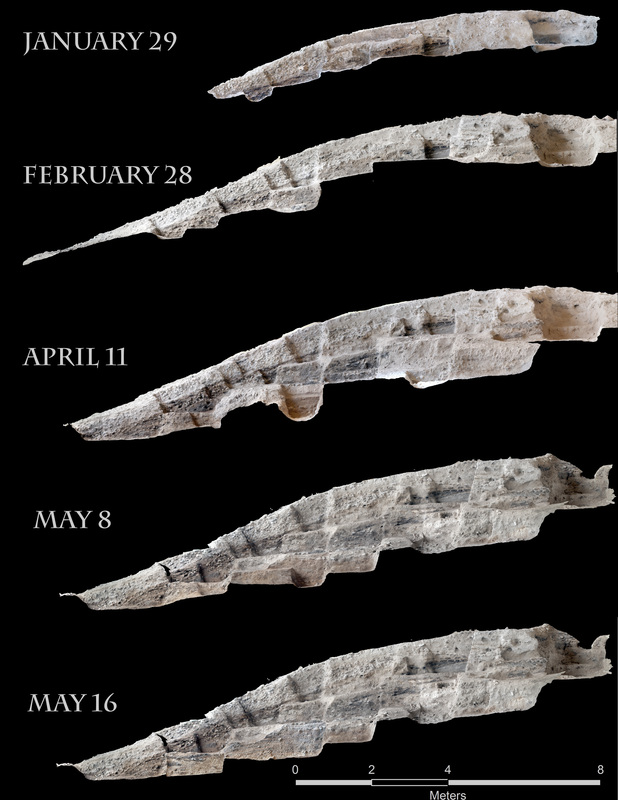 The January-May 2015 field season was very successful, and we will be learning more about Eagle Cave as we begin analyses. We will be returning to Eagle Cave next winter to finish the south wall. In the meantime, look out for future posts, including one about the 2015 ENC Field School at Horse Trail Shelter! This entry was posted in Eagle Cave, Spring ENC 2015 Posts and tagged Eagle Cave. Bookmark the permalink.